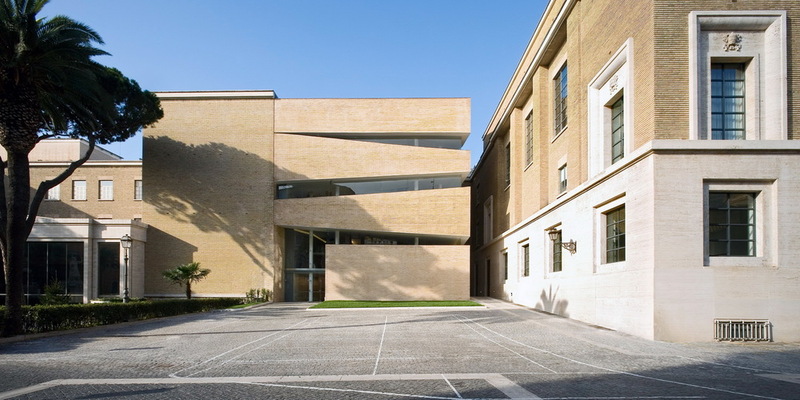 The university holds an outstanding collection of books numbering around 600,000 volumes, some of which date back to the 16th century, whose subjects for the most part coincide with the principal academic courses: philosophy, theology and canonic law. aerial photo of the library The bulk of them are now deposited in the newly restored underground vaults as in the original plan; in the assembly hall block towards the entrance gate. The 25,000 volumes of antique books are kept separately in a humidity controlled archive for better conservation. Originally the reading rooms of the library were dispersed around the university and on the ground floor of the assembly hall block. They are now replaced by the ground floor entrance foyer to the Aula Magna (Main Assembly Hall) and the librarians’ offices. The new reading rooms and book stacks for free consultation are enclosed in the new extension placed closer to the heart of the university with access from the main spine of the first floor corridor. 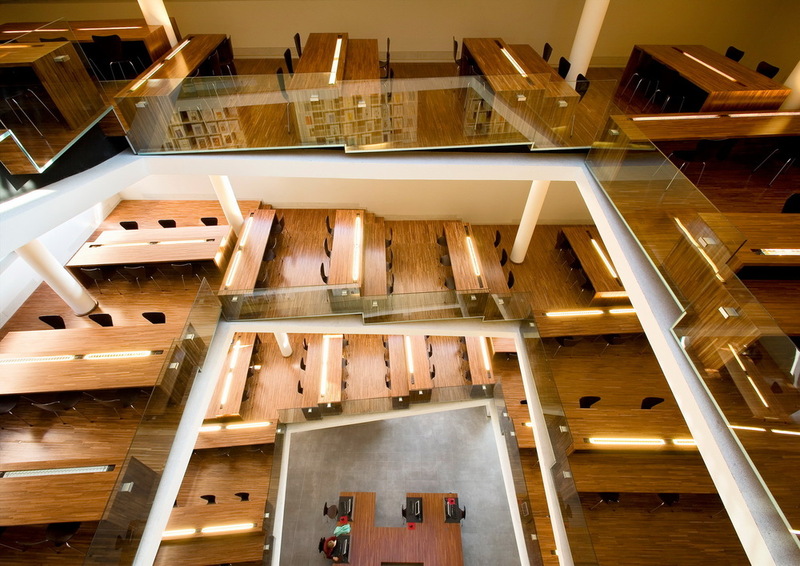 Concentrated in a single volume with access to 70,000 volumes and 750 publications housed in the six floors of book stacks in a fire-protected tower. Externally, the new volume is placed next to a central block of lecture rooms of the “E” shaped plan. 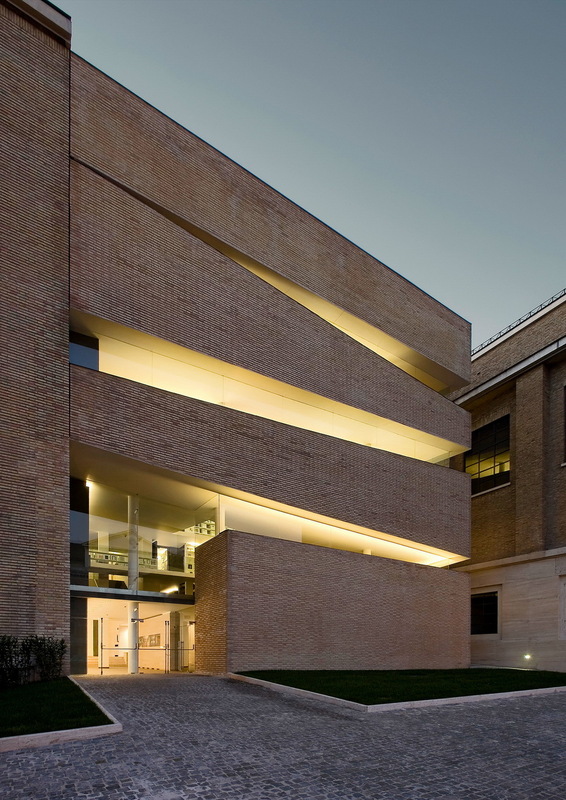 Although it is carefully aligned with the existing volume and clad in the same brick, the new block nevertheless assertively declares its modernity in the play of suspended volumes in light and shade. view towards the entrance lobby The library’s presence can be perceived from within the university; through a series of viewing cones created by joining the window reveals (that once gave on to the exterior) to apertures closed with fire glass in the book stacks. entrance level - computerised index system It is entered from the first floor corridor of the main building down a flight of basalt stairs under the first level of the book stacks into a spacious foyer. This is where the lockers, computer indexes, card index, professors reading room and librarians posting are located. sketch model of ramps, construction of the reading room ramps The library is arranged so that two floors of book stacks are connected by one sloping ramp, “U” shaped in plan. The book stacks are as low as possible to avoid the use of ladders to reach the highest shelves and, given the thin floor slab, are made look like a set of bookshelves themselves. view over reading tables to book-stacks They are connected vertically by a staircase set between the containing wall and the inside of the bookshelves facing the reading ramps, to form in effect a book tower. view through the central void The slope of the ramps is determined by joining the regularly spaced floors of the book stacks to the irregular cuts in the façade which creates the reality (not simply the effect) of volumes floating in light. 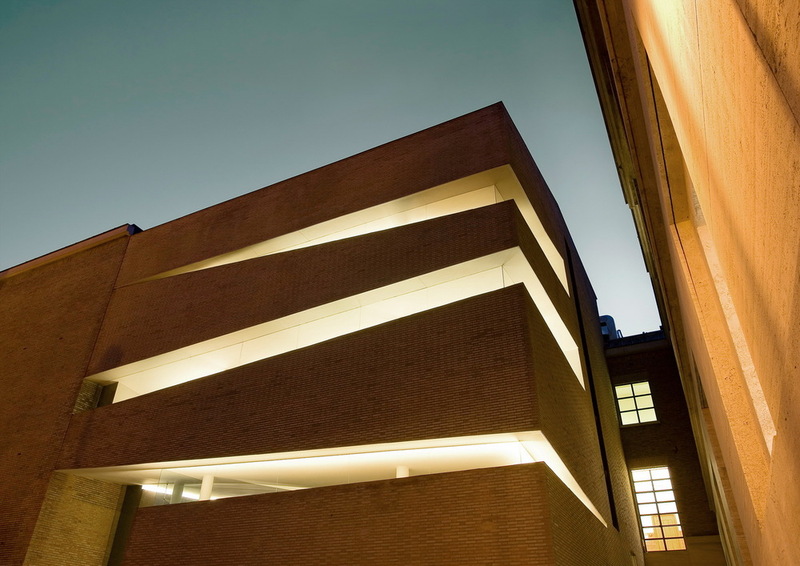 The ramps are not suspended in a void but defined by the light both vertically from the central lightwell and horizontally by the cuts in the two exterior façades. view of reading tables from upper level These ramps are the reading rooms. They are levelled with mahogany platforms on which the reading tables are set. These are also made of mahogany block-wood and house the up-lights for ambient lighting. reading room ramps The underside of the ramps are faceted in steel sheet, the permanent form work of the slabs, according to a complex geometry resulting from an irregularly sloping plane supported on four columns of which the inner and outer edges are necessarily straight. view of the reading room ramps up to the light-well The origin of this design was the structural answer to several stringent architectural demands made on the forbearing and brilliant structural engineer Andrea Imbrenda and namely: as few columns as possible, as thin a slab as possible on foundations that had to side-step some archaeological ruins found during excavations for the foundations. All within the confines of recently implemented seismic safety regulations in addition to normal civil engineering code. 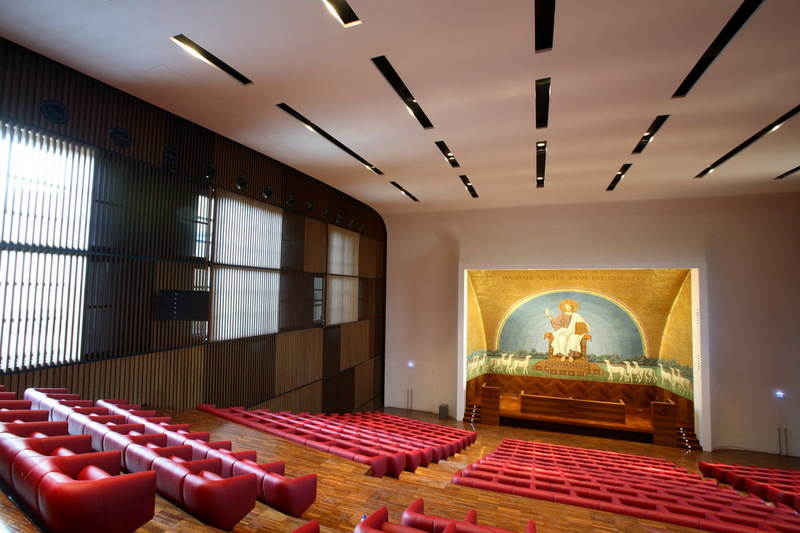 view of the main assembly hall Auditorium The main assembly hall was restored to conform to modern safety and comfort standards as well as to incorporate the technical specification of a modern conference hall: projection facilities, sound diffusion, acoustic control and air conditioning. model of the interior panelling The stepped floor was redesigned to provide safety aisles. A new suspended ceiling and the panelling to the side walls incorporating the black-out system for the existing windows and new seating complete the design. The side walls have been clad firstly with a layer of sound absorption panels and then a series of vertical wooden planks set at varying angles to produce a kinetic wave effect. In correspondence with the windows the planks rotate about the vertical axis to regulate the natural light. seating of the main assembly hall Auditorium Seating Considerable care was taken in the design of the seating. The idea was to achieve a rounded form derived from a moulded upholstery filling. In this case the module is made up a single arm/backrest with the join between modules in the middle of the backrest. When it came to final production Poltrona Frau decided to adopt a more traditional technique, especially for the upholstery filling- and presented a superbly crafted leather armchair, multiplied by 560.